This article is about the World War I army of Germany. For the World War II army of Germany, see German Army (Wehrmacht). For the modern army of Germany and post-World War II army of West Germany, see German Army. For other uses, see Heer (disambiguation). Protecting the German Empire and its interests by using ground and air forces. The Imperial German Army (German: Deutsches Heer) was the name given to the combined land and air forces of the German Empire (excluding the Marine-Fliegerabteilung maritime aviation formations of the Kaiserliche Marine). The term Deutsches Heer is also used for the modern German Army, the land component of the Bundeswehr. The German Army was formed after the unification of Germany under Prussian leadership in 1871 and dissolved in 1919, after the defeat of the German Empire in World War I. The states that made up the German Empire contributed their armies; within the German Confederation, formed after the Napoleonic Wars, each state was responsible for maintaining certain units to be put at the disposal of the Confederation in case of conflict. When operating together, the units were known as the Federal Army (Bundesheer). The Federal Army system functioned during various conflicts of the 19th century, such as the First Schleswig War from 1848–50 but by the time of the Second Schleswig War of 1864, tension had grown between the main powers of the confederation, the Austrian Empire and the Kingdom of Prussia and the German Confederation was dissolved after the Austro-Prussian War of 1866. Prussia formed the North German Confederation and the treaty provided for the maintenance of a Federal Army and a Federal Navy (Bundesmarine or Bundeskriegsmarine). Further laws on military duty also used these terms. Conventions (some later amended) were entered into between the North German Confederation and its member states, subordinating their armies to the Prussian army in time of war, and giving the Prussian Army control over training, doctrine and equipment. Shortly after the outbreak of the Franco-Prussian War in 1870, the North German Confederation also entered into conventions on military matters with states that were not members of the confederation, namely the Bavaria, Württemberg, and Baden. Through these conventions and the 1871 Constitution of the German Empire, an Army of the Realm (Reichsheer) was created. The contingents of the Bavarian, Saxon and Württemberg kingdoms remained semi-autonomous, while the Prussian Army assumed almost total control over the armies of the other states of the Empire. The Constitution of the German Empire, dated April 16, 1871, changed references in the North German Constitution from Federal Army to either Army of the Realm (Reichsheer) or German Army (Deutsches Heer). After 1871, the peacetime armies of the four kingdoms remained relatively distinct. "German Army" was used in various legal documents, such as the Military Penal Code, but otherwise the Prussian, Bavarian, Saxon and Württemberg armies maintained distinct identities. Each kingdom had its own War Ministry, Bavaria and Saxony published their own rank and seniority lists for their officers and the Württemberg list was a separate chapter of the Prussian army rank lists. Württemberg and Saxon units were numbered according to the Prussian system but Bavarian units maintained their own numbers (the 2nd Württemberg Infantry Regiment was Infantry Regiment No. 120 under the Prussian system). The commander of the Imperial German Army, less the Bavarian contingent, was the Kaiser. He was assisted by a Military Cabinet and exercised control through the Prussian Ministry of War and the Great General Staff. The Chief of the General Staff became the Kaiser's main military advisor and the most powerful military figure in the Empire. Bavaria kept its own Ministry of War and General Staff, but coordinated planning with the Prussian Great General Staff. 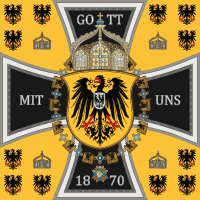 Saxony also maintained its own Ministry of War and the Ministry of War of Württemberg also continued to exist. Command of the Prussian Army had been reformed in the wake of the defeats suffered by Prussia in the Napoleonic Wars. Rather than rely primarily on the martial skills of the individual members of the German nobility, who dominated the military profession, the Prussian Army instituted changes to ensure excellence in leadership, organization and planning. The General Staff system, that sought to institutionalize military excellence, was the main result. It sought to identify military talent at the lower levels and develop it thoroughly through academic training and practical experience on division, corps and higher staffs, up to the Great General Staff, the senior planning body of the army. It provided planning and organizational work during peacetime and wartime. The Prussian General Staff, proven in battle in the Wars of Unification, became the German General Staff upon formation of the German Empire, given Prussia's leading role in the German Army. The basic peacetime organizational structure of the Imperial German Army were the Army inspectorate (Armee-Inspektion), the army corps (Armeekorps), the division and the regiment. During wartime, the staff of the Army inspectorates formed field army commands, which controlled the corps and subordinate units. During World War I, a higher command level, the army group (Heeresgruppe), was created. Each army group controlled several field armies. Germany was divided into army inspectorates, each of which oversaw three or four corps. There were five in 1871, with three more added between 1907 and 1913. The basic organizational formation was the army corps (Armeekorps). The corps consisted of two or more divisions and various support troops, covering a geographical area. The corps was also responsible for maintaining the reserves and Landwehr in the corps area. By 1914, there were 21 corps areas under Prussian jurisdiction and three Bavarian army corps. Besides the regional corps, there was also a Guard Corps (Gardecorps), which controlled the elite Prussian Guard units. 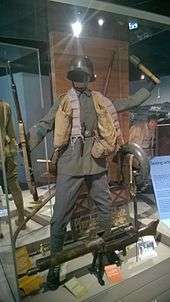 A corps usually included a light infantry (Jäger) battalion, a heavy artillery (Fußartillerie) battalion, an engineer battalion, a telegraph battalion and a trains battalion. Some corps areas also disposed of fortress troops; each of the 25 corps had a Field Aviation Unit (Feldflieger Abteilung) attached to it normally equipped with six unarmed "A" or "B" class unarmed two-seat observation aircraft apiece. In wartime, the army corps became a mobile tactical formation and four Höhere Kavallerie-Kommando (Higher Cavalry Commands) were formed from the Cavalry Inspectorate, the equivalent of corps, being made up of two divisions of cavalry. The areas formerly covered by the corps each became the responsibility of a Wehrkreis (Military District, sometimes translated as Corp Area). The Military Districts were to supervise the training and enlistment of reservists and new recruits. Originally each Military District was linked to an army corps; thus Wehrkreis I took over the area that I. Armeekorps had been responsible for and sent replacements to the same formation. The first sixteen Reserve Corps raised followed the same pattern; X. Reserve-Korps was made up of reservists from the same area as X. Armeekorps. However, these links between rear areas and front line units were broken as the war went on and later corps were raised with troops from all over Germany. The basic tactical formation was the division. A standard Imperial German division consisted of two infantry brigades of two regiments each, a cavalry brigade of two regiments, and an artillery brigade of two regiments. One of the divisions in a corps area usually also managed the corps Landwehr region (Landwehrbezirk). In 1914, besides the Guard Corps (two Guard divisions and a Guard cavalry division), there were 42 regular divisions in the Prussian Army (including four Saxon divisions and two Württemberg divisions), and six divisions in the Bavarian Army. These divisions were all mobilized in August 1914. They were reorganized, receiving engineer companies and other support units from their corps, and giving up most of their cavalry to form cavalry divisions. Reserve divisions were also formed, Landwehr brigades were aggregated into divisions, and other divisions were formed from replacement (Ersatz) units. As World War I progressed, additional divisions were formed, and by wars' end, 251 divisions had been formed or reformed in the German Army's structure. The regiment was the basic combat unit as well as the recruiting base for soldiers. When inducted, a soldier entered a regiment, usually through its replacement battalion, and received his basic training. There were three basic types of regiment: infantry, cavalry and artillery. Other specialties, such as pioneers (combat engineers) and signal troops, were organized into smaller support units. Regiments also carried the traditions of the army, in many cases stretching back into the 17th and 18th centuries. After World War I, regimental traditions were carried forward in the Reichswehr and its successor, the Wehrmacht, but the chain of tradition was broken in 1945 as West German and East German units did not carry forward pre-1945 traditions. the Prussian system... was based on service of only three years with the colors... and four years in the reserve. The Prussian standing army had become simply a training cadre for the intake of conscripts. The Prussian army's organization for peace and war was virtually the same. Prussia was divided into army-corps districts for the purposes both of administration and of recruitment. On the outbreak of war the command organizations of the district became that of a corps in the field. Localization of the Army and its recruitment gave the districts pride and interest in their 'own' corps. Germany had the largest industrial base in Europe, having surpassed Britain by 1900. The Army closely cooperated with industry, especially in the World War, with particular focus on the very rapidly changing aircraft industry. The Army set prices and labor exemptions, regulated the supply of credit and raw materials, limited patent rights so as to allow cross-licensing among firms, and supervised management–labor relationships. The result was very rapid expansion and a high output of high quality aircraft, as well as high wages that attracted the best machinists. Apart from aircraft, the Army's regulation of the rest of the war economy was inefficient. The Deutsche Luftstreitkräfte, known before 1916 as Die Fliegertruppen des deutschen Kaiserreiches (Imperial German Flying Troops), was the over-land air arm of the German Army during World War I (1914–1918). Although its name actually means something very close to "The German Air Force", it remained an integral part of the German Army for the duration of the war. Lance Corporal (Gefreiter); up until 1918 the only rank (with exception of Obergefreiter in the foot artillery) to which an enlisted soldier could be promoted, the rank was a deputy rank to the Corporal (Unteroffizier) rank. One-Year Volunteer Enlistee (Einjährig-Freiwilliger): despite the name, one-year volunteers were actually conscripts who served a short-term form of active military service, open for enlistees up to the age of 25. Such enlisted soldiers were usually high school graduates (Matura, Abitur), who would opt to serve a one-year term rather than the regular two or three-year conscription term, with free selection of their chosen military service branch and unit, but throughout were obligated to equip and subsist themselves at entirely their own cost. In today's monetary value, this could at bare minimum cost some 10,000 euro, which purposely reserved this path open to officer-material sons from mostly affluent social class families wishing to pursue the Reserve-Officer path; it was the specific intention of Wilhelm II that such Reserve-Officer career path should only be open to members of so-called "officer-material" social classes. On absolving their primary recruit training and shorter military service term, those aspiring to become Reserve-Officers would have to qualify and achieve suitability for promotion to the Gefreiter rank and then would continue to receive further specialized instruction until the end of their one-year term, usually attaining and leaving as surplus Corporals (überzählige Unteroffiziere) (Reservists), with the opportunity to advance further as reservists. Enlistees who did not aspire to officer grade would leave at the end of their one-year term as Gemeine (Ordinary soldier) enlisted rank (for example Musketier or Infanterist) and a six-year reserve duty obligation. Eligibility for this specific one-year path of military service was a privilege approved upon examining the enlistee's suitability and academic qualifications. Long-Term Volunteer Enlistee "Capitulant" (Kapitulant): enlisted soldiers who had already absolved their regular two or three-year military conscription term and had now volunteered to continue serving for further terms, minimum was 4 years, generally up to 12 years. The Imperial Army was abolished on 6 March 1919, and the provisional Reichswehr was created. ↑ Xavier Bara, Xavier (2012). "The Kishū Army and the Setting of the Prussian Model in Feudal Japan, 1860–1871". War in History. 19 (2): 153–171. ↑ Morrow, John H., Jr (1977). "Industrialization Mobilization in World War I: The Prussian Army and the Aircraft Industry". Journal of Economic History. 37 (1): 3651. JSTOR 2119443. ↑ Duden; Origin and meaning of "Korporal", in German. 1 2 "Gefreiter" – Allgemeine Encyclopädie der Wissenschaften und Künste, Erste Section, A-G, (Universal Encyclopaedia of the Sciences and Arts, First Section, A-G), Author: Johann Samuel Ersch and Johann Gottfried Gruber, Publisher: F. A. Brockhaus, Leipzig, 1852, Page 471-472, in German. ↑ Duden; Definition of "Gemeine", in German. ↑ Duden; Definition of "Kapitulant", in German. ↑ Edmonds, James (1987). The Occupation of the Rhineland. London: HMSO. p. 213. ISBN 0-11-290454-8. Stevenson, David. "Fortifications and the European Military Balance before 1914." Journal of Strategic Studies (2012) 35#6 pp: 829–859. Stone, James. "Spies and diplomats in Bismarck’s Germany: collaboration between military intelligence and the Foreign Office, 1871–1881." Journal of Intelligence History (2014) 13#1 pp: 22–40. Wikimedia Commons has media related to Deutsches Heer.